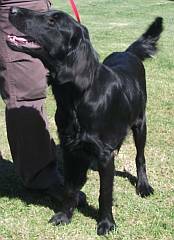 Flat coated retrievers originated in UK & can be traced back to 1864. The dogs were used to fetch game after the hunter had shot it. Pheasants, partridge, hare, and rabbit were hunted for the pot. The dogs have a soft mouth that is big enough to carry the prey. 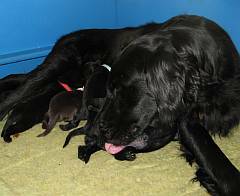 The breed is descended from Newfoundland dogs. The dogs learned how to retrieve game from both land and water. They also became adept at flushing game from hiding places and chasing it uphill and down. Today, the breed is fairly scarce. They are well-behaved, friendly, playful dogs who love people, children, and other dogs. They are not a ferocious guard dogs! The tail wags all the time. The owner must give plenty of time for this breed. They like to go for walks in the country, hunting in the bush, or for a swim in the river. 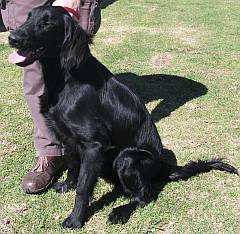 The flatcoat is a medium size dog with high energy. Coat: The coat should lie flat on the back. It is dense and shiny, of medium length, with long feathers on legs and the tail. It benefits from daily brushing, so it may not be the breed for one who is allergic to dog hair. Brushing the dog is a good way to check for parasites and skin trouble like dermatitis & wet eczema (hot spots). Colour: solid black or solid liver coat. The eyes are brown.